Of course, Pew is not surveying actual voters. It’s surveying all adults. But that is the point. 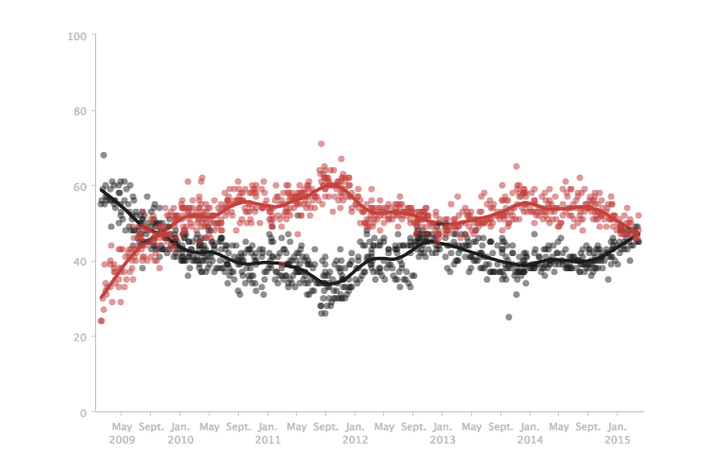 What changed between 2012 and 2014 was not public opinion, but who showed up to vote. 2. 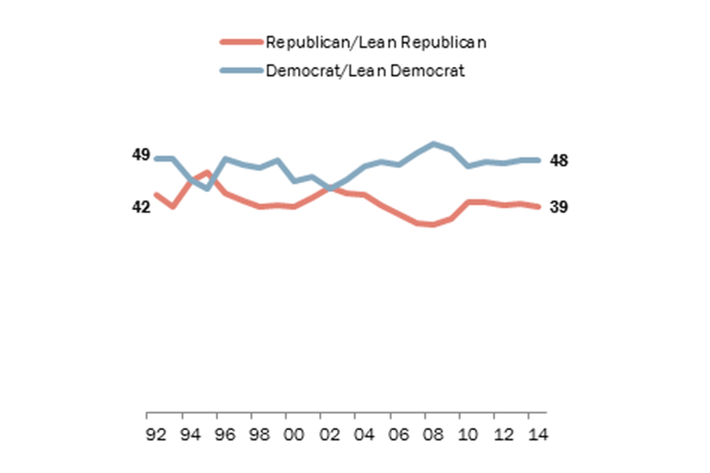 No, youngsters are not turning Republican. 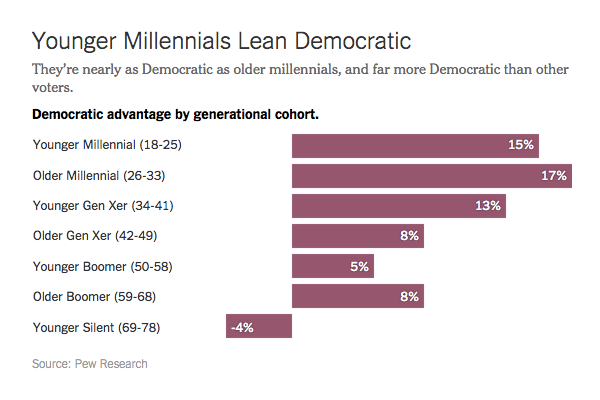 The Emerging Democratic Majority thesis places a lot of weight on cohort replacement: Republicans fare best with the oldest voters, and Democrats with the youngest, so every new election cycle incrementally tilts the electoral playing field toward the Democrats. Skeptics have pushed back by claiming that the youngest voters — the ones entering their voting years since 2008 — are turning back toward the Republican Party. Their main evidence has been pollings of millennial voters by the Harvard Institute of Politics. Conservatives have given these results a great deal of attention — it suggests that the youngest voters, disillusioned by the Obama administration, have abandoned the liberal tendencies of their older brothers and sisters. But Harvard’s polling has not held up well; it predicted millennial voters would support a Republican Congress in 2014, which turned out to be extremely inaccurate. 3. 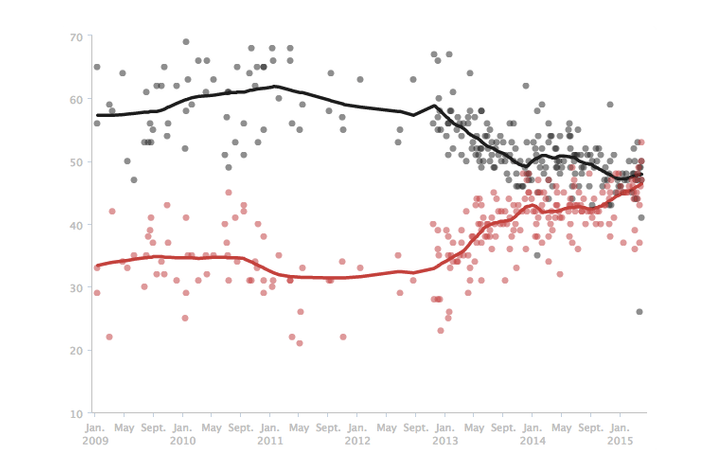 Clinton isn’t that unpopular. 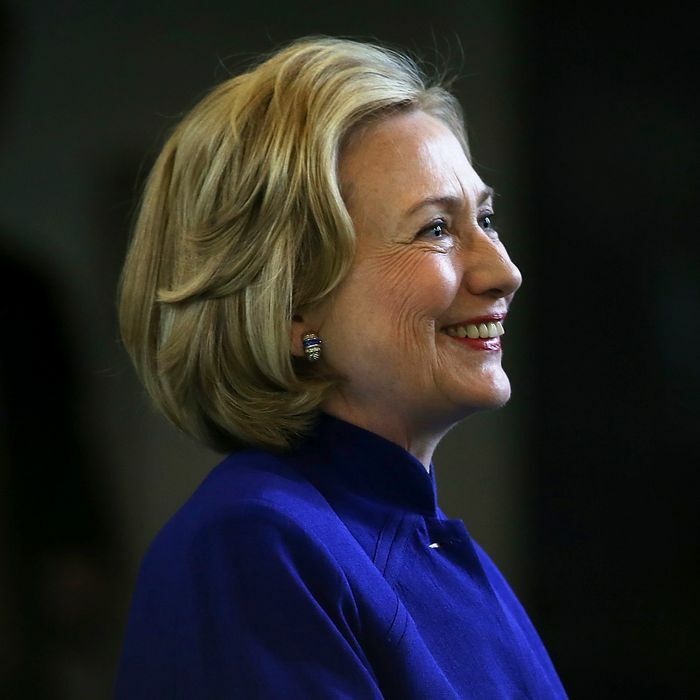 A more recent line of thought has settled on Clinton’s limits as a candidate. It is probably true that she lacks Obama’s talents as a communicator and a campaign organizer. A recent Quinnipiac poll showing her struggling in Iowa and Colorado attracted wide media attention and seemed to confirm that the email scandal has tarnished Clinton’s national image. So there is little reason to think Clinton’s personal unpopularity will hold her back in a race against a Republican who is likely to have no more personal appeal, and possibly a lot less. 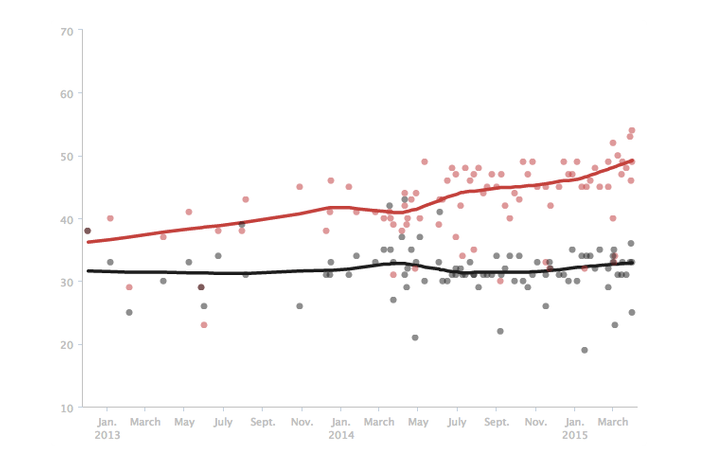 If the economy continues to expand between now and the 2016 election, Obama’s approval rating will probably rise a little higher. In the modern political world, strong popularity is not necessary to win; Obama won reelection with approval ratings below 50 percent. Voters make comparative choices, and all a candidate needs is to be superior to the alternative. But the economy is currently on a course, barring a slowdown, to leave the incumbent party in a stronger position. 5. Is it time for a change? The one remaining ground for Republican optimism is the possibility that voters will decide three straight presidential terms for the Democratic Party is too much. Many political scientists (such as Alan Abramowitz) believe this exhaustion factor is real; after a second term, voters grow increasingly restless with the in-party and are more likely to decide it’s time for a change. If this is true, Clinton may face headwinds even in an otherwise favorable landscape. It may well be true. But there are reasons to doubt it. One reason is that models that detect voter impatience are based on a very small number of data points. Since World War II, there have been eight presidential elections in which the incumbent party has held office for two terms or more. It’s hard to draw definitive conclusions from such a limited number of events. A second reason is that nearly all of those elections took place in a very different kind of party system. The 20th century was a time of loose-knit parties with a great deal of ideological overlap. There were liberal Republicans and conservative Democrats, which created large constituencies to swing back and forth. Democrats won more than 60 percent of the vote in the 1964 election, and then Republicans did the same eight years later. That made sense in a world where the two parties seemed to share a lot of common assumptions. Voters who supported Lyndon Johnson in 1964 weren’t crazy to switch to Richard Nixon in 1972; Nixon had established the Environmental Protection Agency and supported universal health care and a basic income. The polarized electorate of today is a different place, and voters may not act the same way as they used to. There are fewer swing voters, and therefore conditions like a third straight term, or even a severe recession, may not budge as many of them from their normal partisan habits. We don’t know how deeply the partisan split has hardened into place; each party seems to be able to count on the support of at least 45 percent of the voters regardless of what is happening in the world. 6. There’s no alternative. All of the above brings us back to the central challenge facing Clinton. She cannot promise her supporters a dramatic change or new possibilities; she is personally too familiar, and the near certainty of at least one Republican-controlled chamber of Congress suggests continued legislative stalemate. Her worry is that ennui sets in among the base and yields a small electorate more like the kind that shows up at the midterms, which is an electorate Republicans can win. The argument for Clinton in 2016 is that she is the candidate of the only major American political party not run by lunatics. There is only one choice for voters who want a president who accepts climate science and rejects voodoo economics, and whose domestic platform would not engineer the largest upward redistribution of resources in American history. Even if the relatively sober Jeb Bush wins the nomination, he will have to accommodate himself to his party’s barking-mad consensus. She is non-crazy America’s choice by default. And it is not necessarily an exciting choice, but it is an easy one, and a proposition behind which she will probably command a majority.